The Colonial City of Arequipa in Peru can really make you feel as though you have been transported to a European Metropolis. Moreover there is the amazing presence of Spanish architecture set in a back drop of snow-capped peaks of the Andes Mountains and the amazing Misti Volcano overlooking the entire city. Peru El Misti Volcanoe. Photo credit: Shutterstock. The sight of this still active volcano standing 5822 meters makes for stunning photography and even the amateur can look professional! 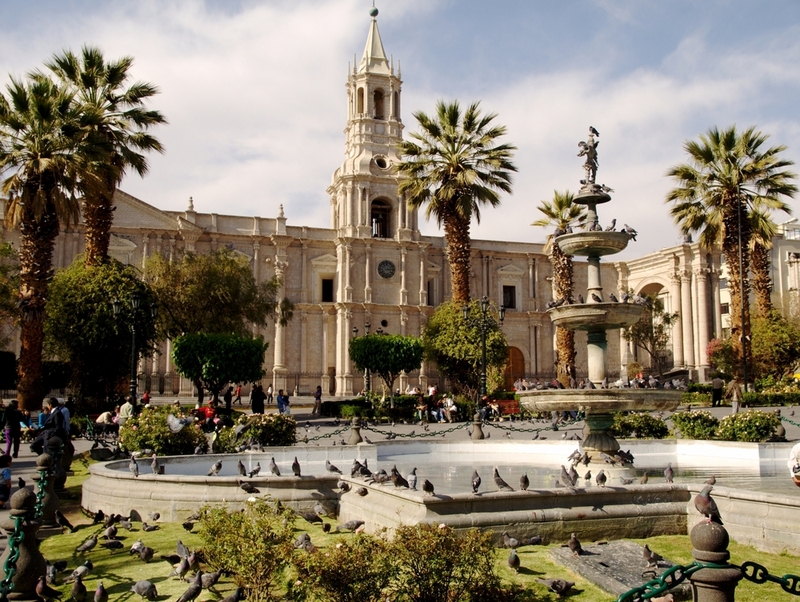 The city of Arequipa is a very clean Peruvian city and tourism is the centre of an amazing charm the city boasts. It is the second most populous city and now a UNESCO World heritage site. Known as the “White City “due to the many houses made from sillar a type of white volcanic stone. Plaza De Armas, Arequipa. Photo credit: Shutterstock. Arequipa like most major Peruvian towns is a hub of activity all based around the main Plaza De Armas , a piazza in the middle of Arequipa’s Historical center. It is a city that due to the popularity now of Peruvian cuisine hosts many incredible restaurants and small bars. Chi Cha is a restaurant that cannot be missed and is owned by famed Peruvian chef Gaston Accuria. Modern Peruvian cuisine and innovative cocktails all based in a fun and casual environment just off the main square. The Zig Zag restaurant is also popular amongst the many travelers that frequent the town and has a menu based with meats cooked on a unique volcano stone grill. The prices in restaurants in Arequipa for the upscale quality are not over the top and tourists have the ability to choose from many nationalities depending on what they feel like. Monasterio de Santa Catalina. Photo credit: Shutterstock. 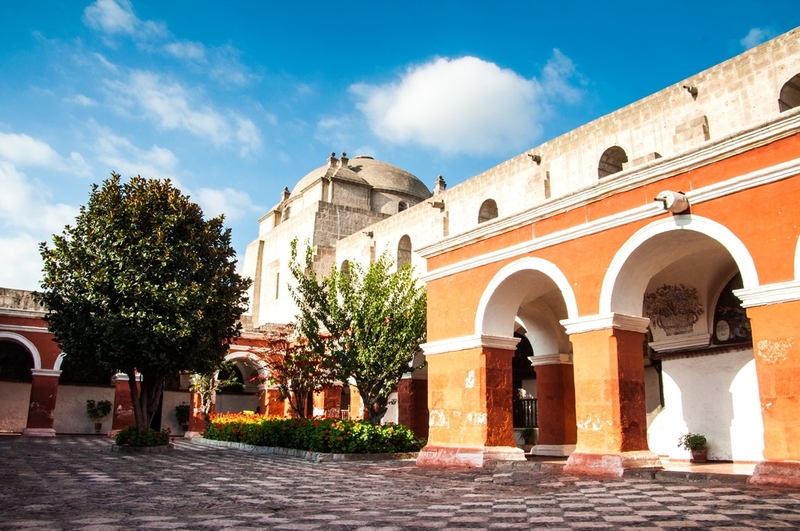 Arequipa plays a host too many interesting monuments and museums all located within a walking distance to each other. The most popular being the Museum of Andean Sanctuaries and the Monastery of Saint Catherine (Monasterio de Santa Catalina). The Museum of Andean Sanctuaries is most famous as it holds the remains of a little girl called Juanita the Ice Maiden of Mount Ampato. Juanita is a well preserved corpse of a young girl that was presumed killed as an offering to the Incan Gods. She is one of the most preserved mummies ever discovered and is now on show within the museum. She was discovered on top of Mount Ampato when an eruption melted the top of the peak. Dressed in brightly coloured burial tapestry and with a collection of grave goods, bowls, pins and figurines made of gold and silver. The Santa Catalina Monastery was a city within a city and once housed over 450 nuns and servants. Closed off from the city with high walls it is still a place of worship. Beautiful in decoration and colourful design it is really a must do tourist attraction. The nuns that lived in the Monastery were closed to the outside world until 1970. It is a Monastery with over 100 rooms, corridors and very old works of art scattered throughout the building. It is worth having a look through and can be done only with a guide. 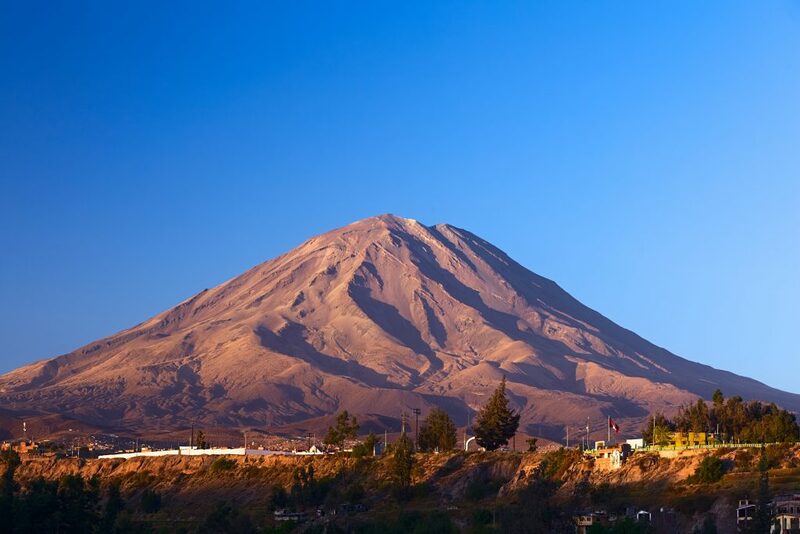 Due to the surrounding Andes Mountains Range, Arequipa is very much on the tourist route throughout Peru and has some of the most popular treks and day tours in the region. Tourist love to hike Misti Volcano, Cachani Mountain and the 3 hour drive to Colca Canyon is very much on all itineraries. Colca Canyon runs sum 100 km through the Andes and is the second deepest canyon in the world. It reaches some 3400m at the deepest point and the drive from Arequipa to the canyon is stunning. It is unbelievable to gaze on the massive Condor’s soaring through the canyon, with the impressive backdrop of the mountains. Along the way from Arequipa to Colca you will pass through some pre Incan towns that have been relatively untouched since the Spanish arrived. You can be witness to the centuries old traditions of terrace fields that still lay on the slopes of the mountains. Most people will have an overnight package staying in one of the many beautiful hotels in the town of Chivay before waking up early to head to a main point called Cruz Del Condor to watch these amazing birds fly almost putting on a show for the many tourists that want to see them and take what I can describe as possibly one of the best pictures whilst on holidays. If you have time also pay a visit to the Caldera Hot Springs and relax in the warm waters. Arequipa for me is a town that has all the charms of any European City but with the ancient Incan history running through it gives it that something special and unique to other cities. It should be on any Peruvian Itinerary and I cannot express enough how including this would really make your trip to Peru that even more special. You will not be disappointed! Are you already excited to visit Peru? Chimu Adventures offers tours to South America as well as tailor-made packages according to all your wishes. Click here for more information about Chimu.